This is just a big picture post of all the goodies I locked down by doing fun manicures for family and friends. I'm really excited to show it all off, but really this is just filler while I go about collecting photos from all my friends of their funky nail-dos so I can do a guest mani post. Sorry it's winding up being about a week between posts here. I think that's going to be the norm until April, as I am working on a tapestry submission for an upcoming touring exhibition. Also I promise PROMISE I am working away at my first giveaway. I'm pretty excited about it. I put my little stash together and I've decided I want to add a few more polishes to the mix, so that will probably take until after my next payday. But it's in the works! 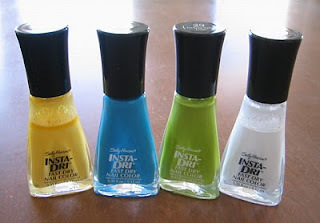 I found out that the white, and the yellow will work for stamping. the yellow one, of course only really works on some colors, but I look forward to trying out the blue and green as well. Hey, I can do some fun manicures on light backgrounds. :D You can see I've used quite a bit of the yellow and white already. :) I actually picked up another bottle of white and I have a slightly different yellow which hasn't got a name just the number 04. Sally Hansen Complete Salon Manicure in: Gray By Gray, Thinking of Blue, Wet Clay, and Commander in Chic. Drool. The Thinking of Blue I've actually used as a one coater under full nail stamps. I love one coaters. Also the bruses are really wide, and I found they worked for me, especially when painting other people's nails. SH Xtreme Wear in: Black Out, Sun Kissed, Lime Lights, Emerald City, Blue It, White On, and three frankens using 3 bottles of White On and a few drops of more saturated colors. Sorry I can't remember which ones! 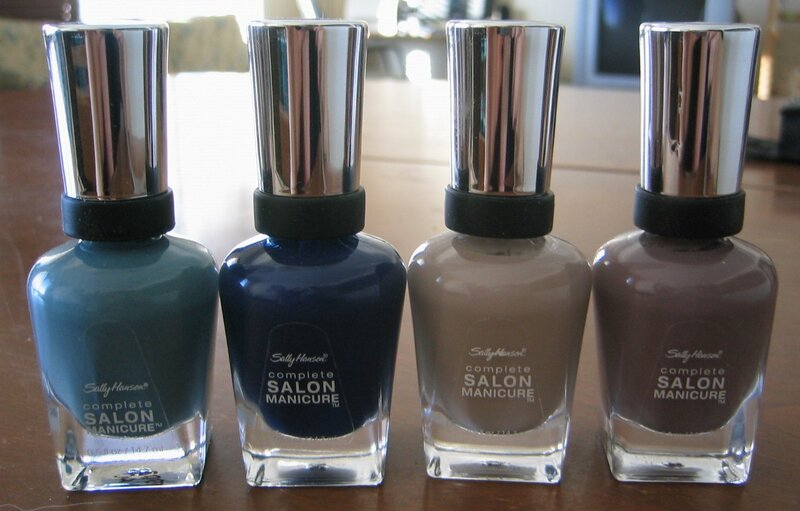 Left to Right: Sally Hansen Diamond Strength Diamonds and Brilliant Blush, Joe Moss, L'Oreal Luminescence and Party Hop, Revlon No Shrinking Violet, Minted, Totally Toffee. Sally Hansen HD Hi-Def, Digital, and Resolution, Red Girl-dollar store finds by the hubby-Star (holo hearts and circles) and Illusions (holo bar glitters), Cover Girl Disco Dazzle, and Pink Twinkle. 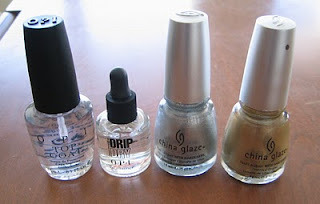 OPI Top Coat and Drip Dry, China Glaze Cheers to You and Midnight Kiss. Gosh is my new best friend right now. All four of these stamp and stamp well. 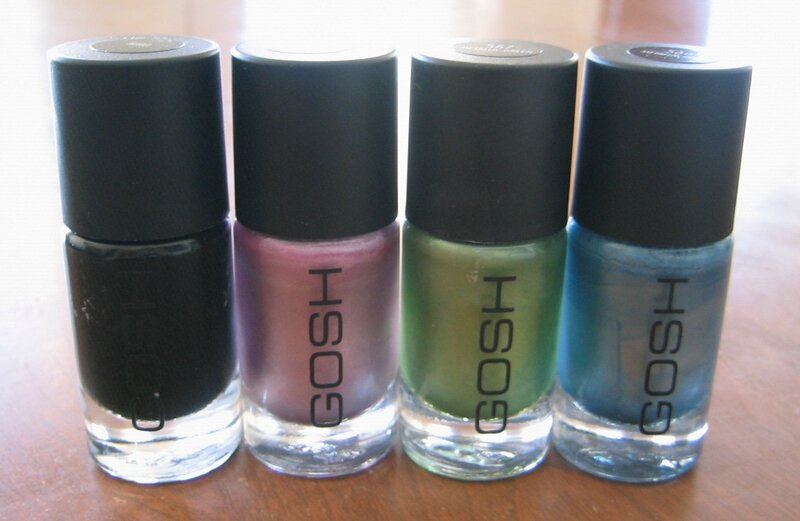 Left to right: Nero, Metallic Purple, Metallic Green, Metallic Blue. I went out and picked up a second bottle of Nero already because stamping black is a staple for me. 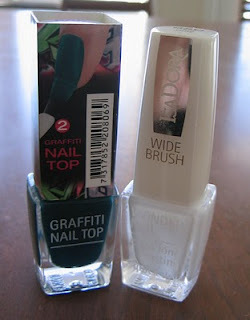 Graffiti Nail Top in Subway Green--Which is this most amazing dark teal YUM. and Plain White for the base color. OHHHH Boy that was a lot of spam. Sorry for the lame color quality! Cheers and have a great week! WOW! WOW! WOW! 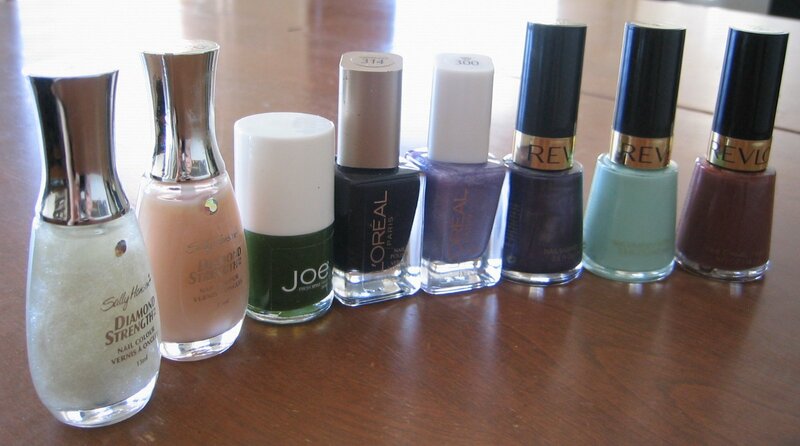 So much nail polish! But never enough, right? Lol. Congrats on your first O.P.I's! You'll love them! And you got some really awesome colors! What a lovely haul. 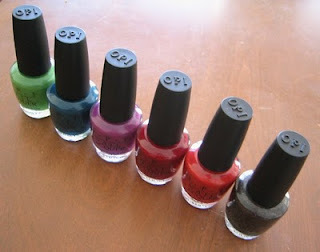 You'll have to tell me how you like OPI. I'm pretty sure the contents of this one haul surpasses my entire collection. I'm a little in love with all the teal. TEAL. Lovely: You're welcome! I definitely hope you try it out! It's a great way to get some variations in value. Lindsay: Thanks! No never enough! Although I feel pretty saturated at this point. A little overwhelmed at it all! But happy and it was a fun way to earn them by doing manicures for people! Anita: I LURV it SO MUCH! Sarah: I know it's a lot of polish! o.O Ski Teal We Drop is soooo pretty! You know we're totally doing argyle manicure for you if you come. Maybe we can use teal and black or metallic blue! IsaDora Graffiti Nail Top SUBWAY GREEN! KONADLICIOUS' HUGE 1,000 FOLLOWER GIVEAWAY! !